If you’re looking for fun things to do with the family this Easter look no further. We’ve got a great line up of fun and FREE Easter activities here in Athlone Towncentre to keep the kids busy over the Easter School Holidays. 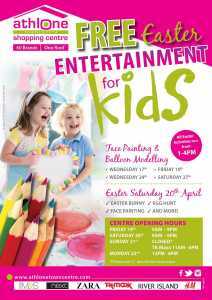 Join us for face painting & balloon modeling on Wednesday 17th, Friday 19th, Wednesday 24th & Saturday 27th April. Come along to the Athlone Towncentre Shopping centre on Easter Saturday, April 20th, for some serious family fun! Get your face painted and Join in our great big Easter Egg Hunt and meet our very special guest… The Easter Bunny himself! He’ll be here in Athlone Towncentre with some yummy chocolate treats for his little friends.